DTECH thin VGA computer monitor cable enables you to add more bulk cables to work space and yet the space is neat, while those bulky, stiff round cables could waste your room. The PC monitor cable 50ft would be ideal for running the cord under the carpet, along the wall. 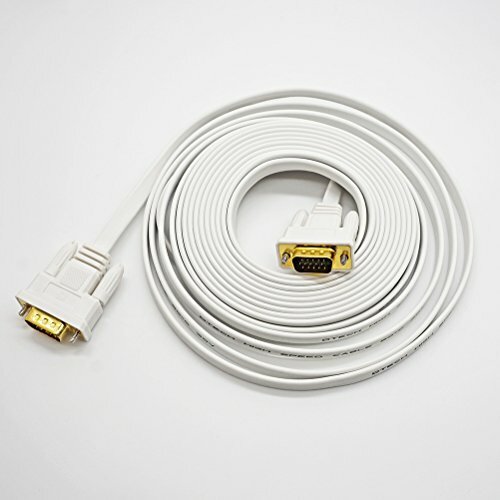 15 pin VGA to VGA cable provides superior performance compared favorably with round cables, because it's built with quality gold-plated connectors and 100% bare copper conductors. And EMI and RFI noise are greatly reduced with foil and copper braid shielding, No ghosting and no degradation. RiteAV - VGA Cable with 3.5mm Audio - 25 Ft.